Galaxy Trucker is an exciting and energising game, but it’s also characterised by a distinctive profile of play that is almost unique in board gaming. 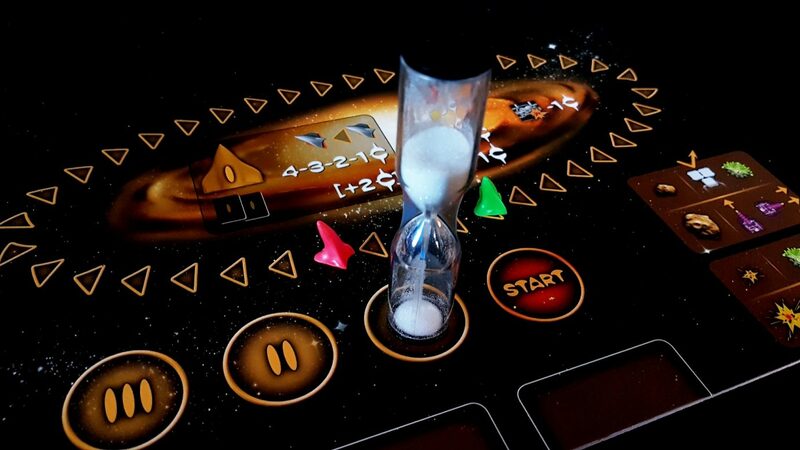 It is the tabletop equivalent of ‘hurry up and wait’, with bursts of intense, frantic activity followed by longer periods of almost soporifically passive downtime. Let’s look at how we rate it from an accessibility perspective. As with Suburbia, we’ll be using our own bespoke, experimental diagnostic framework for this tear down. Any feedback on what we got right, what we got wrong, and what we didn’t address should be sent to dice@imaginary-realities.com. 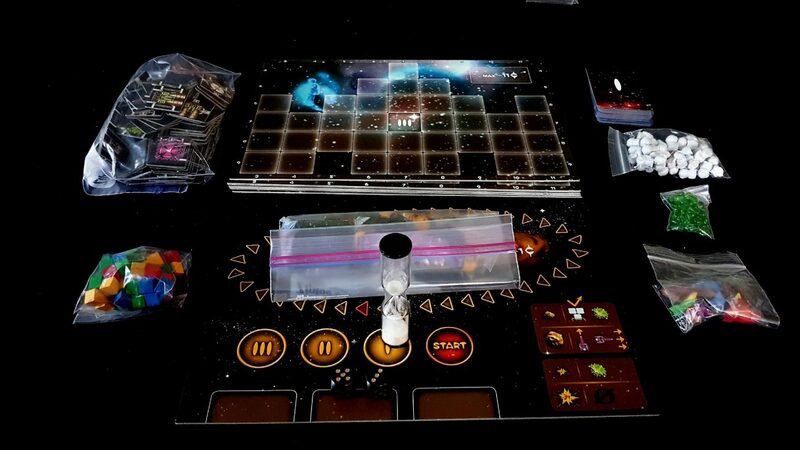 You can find our review of Galaxy Trucker here. I know what’s on offer. I just don’t want any of it. 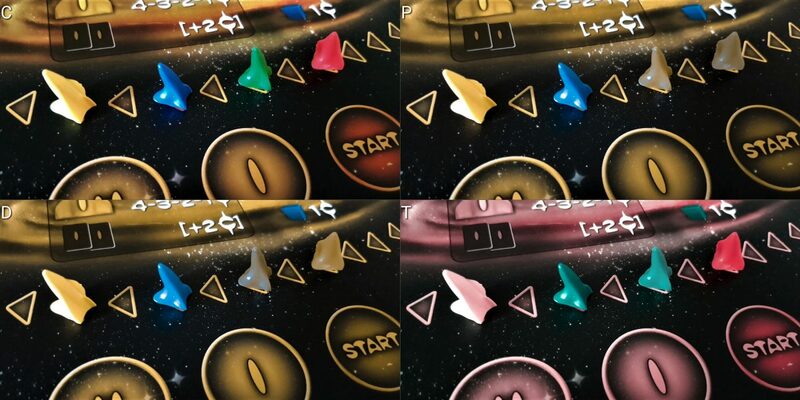 While all of the tokens are visually distinctive, the colour choices throughout are poorly differentiated for those with colour blindness – the cubes, the player position tokens, and even the alien crew-members are offenders for this. 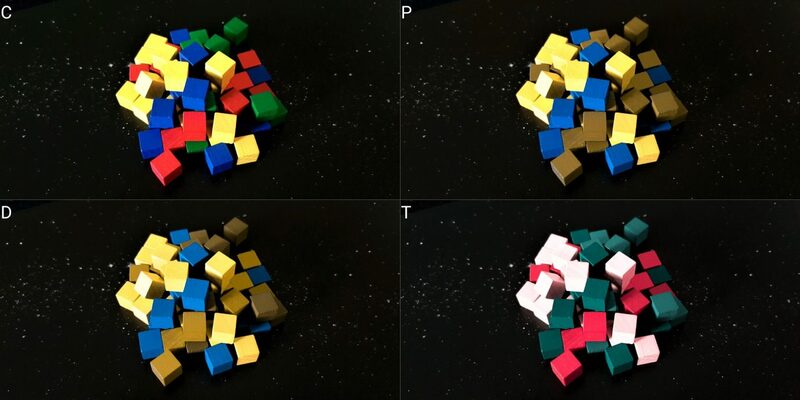 It’s not *impossible* to tell them apart, but it’s far more difficult than it should be – look at the image below – top left is normal colour vision. 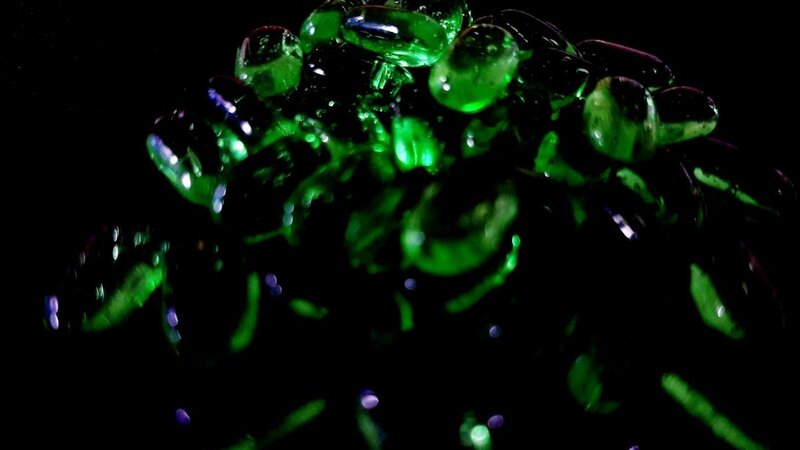 Top right is protanope, and it’s not easy to tell green and red apart. Bottom left is deuteronope, and good luck telling yellow and red apart without squinting. Bottom right is tritanope, and you can see the difficulty in telling the difference between blue and green. Wait, which one am I again? Uh – I’m not sure if this is hazardous but I’ll just put it in with the babies and the puppies. Look, as long as I get something it doesn’t matter. 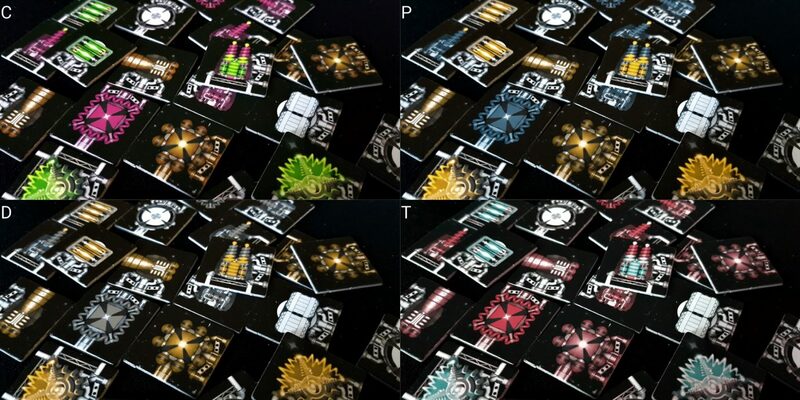 To be fair, none of this is an issue in the time-constrained portion of the game – while colours are a minor issue there, the graphical design of the tokens is sufficiently distinct that it’s easy to tell whether you’re looking at an engine or a laser. A larger issue though is the general game design itself, which makes it almost impossible to play if you have significant visual impairment. I say ‘almost’ because I have long come to realise the ingenuity of game-players far outstrips my own ability to foretell creative workarounds. That said, I can’t perceive a way that those with poor vision would be able to meaningfully take part in game play. 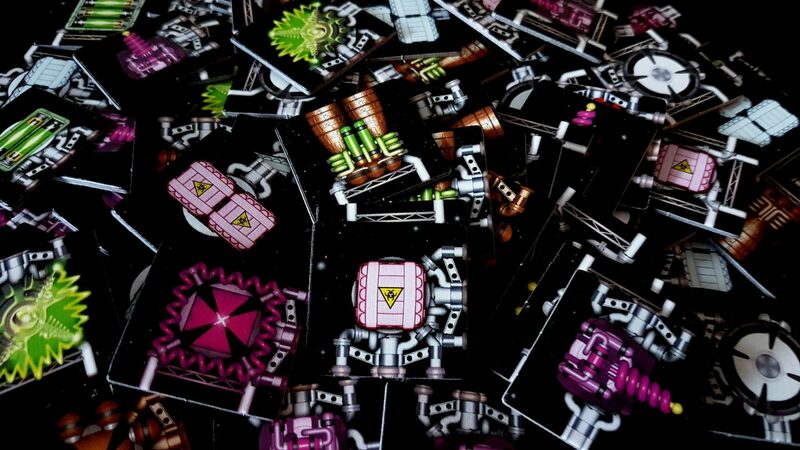 It’s possible to make use of a ‘turn’ based system for ship building to give people time to fully examine the pieces with supporting equipment such as microscopes or mobile phone magnifiers, but it takes away almost everything that makes Galaxy Trucker distinctively entertaining. So much of the game is about compounding failure under stress that to lose that element is to cut out its beating heart. If a user is sighted but with reduced visual acuity, the need to line up connectors and decide on which fit against which is difficult to perform under duress. The mechanics of the ship-building stage will also require players to be able to visually identify the differences between similar looking pieces at a distance, and a strict adherence to the game rules means that mistakenly selecting a piece during building has a lasting consequence. Obviously, you can choose to be more forgiving of this than the game allows, and you can make time bonuses available to reduce some of the unfairness. As with adopting a turn based system, something is lost when compensatory strategies like this are required. In short, we couldn’t possibly recommend this game to those with visual impairments, although we do acknowledge there are semi-effective workarounds available for those prepared to make the effort. There are games that are much more visually accessible though we would recommend over this, every time. It doesn’t require a *lot* of cognitive processing, and the processing it requires isn’t especially complex. Realistically, given the nature of the game, almost any ship *can* make a profit from a journey – so much of it is down to luck of the draw, rolling of the dice, or your position in the convoy. Very good players can plan ahead by reading from a portion of the pre-picked journey deck, and build their ship accordingly. 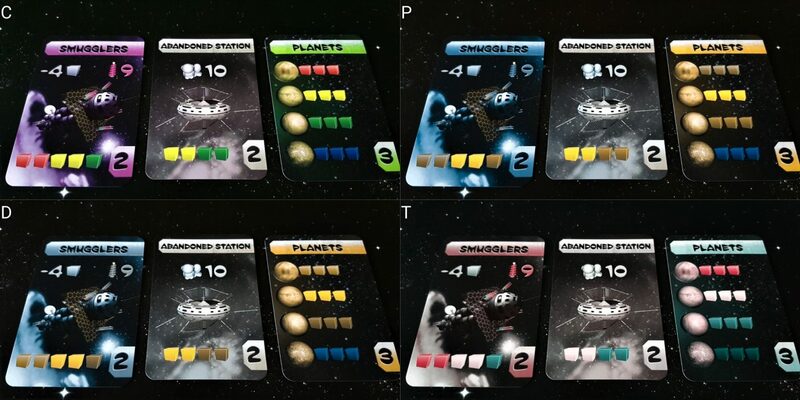 However, they only ever get to see a subset of the cards ahead, and the nature of Galaxy Trucker is that it almost inevitably favours generalist design rather than specialised design. A ship brimming with lasers and engines might thrive in a journey full of pirates and slavers, but it’ll need to pass on the lucrative planets that it encounters. On the other hand, a ship with lots of cargo bays and crew slots might not last long in a fight, but it can pick up enough cargo that it makes a healthy profit at the end. There are only a few explicit failure states in the game, and only a few ships will ever meet them out of the box. Part of the inherent despair-generation of the game is that talent in ship-design will only take you so far – it’s possible to design a ship that is perfect on paper but emerges at the end of the journey as little more than a twisted hunk of scarred, molten metal. Similarly, it’s possible to build a space-borne deathtrap that makes it through unscathed. So, while the game may seem cognitively intensive, much of that is as a result of an illusion of effectiveness in tactical adaption. Build a ship randomly, it’ll still fly. Probably. In the base game, there are relatively few distinct tokens, but they do interact in potentially interesting ways – an alien life-support system must be placed connected to a crew cabin before an alien can board the ship, for example. Double lasers, batteries and shields all require battery support. Engines and lasers have placement rules, and the effect a shield has on a ship depends on its orientation in the structure. Sensible and legal ship placement requires an understanding of this, but the rules for token placement are not especially complex. Uh… which one is going to hurt me the least? The player with the fewest crew members draws enemy fire. Light laser fire comes from the right, requiring a dice roll. Only shields prevent damage to ships from light laser fire. Heavy laser fire comes from the rear. Nothing stops damage from heavy laser fire. Now, all of these steps are independently simple, but look at that card – it’s like reading mystical runes. Once you understand the notation, it’s fine (a very similar notation is used for the meteoric swarm), but it’s quite a lot to take in at once. Look at the pirates card – this one says ‘If you have less than six laser power, the pirates will fire on you. If you have more than six, you get seven space-bucks for defeating them’. The only thing an individual pilot has to decide here is whether they want to use battery power to energise double cannons. Everything else is out of their control. It permits for someone to take on the role of a completely transparent ‘games master’ for the journey, limiting the cognitive cost for individual players. Some of the cards may require a little support for those with serious cognitive impairments. 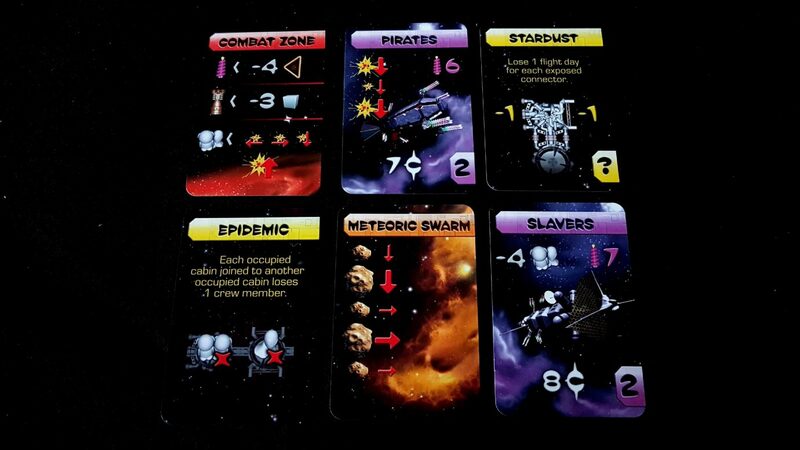 The epidemic card, for example, is dependent on adjacency of state in the ship – you need to be able to work out how it impacts on the design of a specific ship in the convoy, although in the end it resolves down to something straightforward such as ‘you lose two of your crew’. Let’s just get this out of the way – we don’t recommend this game at all if emotional upset is at all a factor. We recommend it not one little bit. There is a lot of fun and hilarity to be had in this game, but almost all of it is driven by laughing at the misfortune of others, or enjoying the discomfort caused by managing a failure cascade under timed duress. The first of our reasons for an anti-recommendation is the challenge – it’s considerable. It’s *hard* to make a good ship, and almost impossible to make one that will be guaranteed to survive a journey. It is the act of building itself that is enjoyable – what happens after it almost has to be thought of as a game play blooper reel. The challenges that are thrown up by a journey cannot be predicted with any degree of certainty, and you have little ability to influence the eventual result of the journey once your ship takes to the convoy. It leads to an overwhelming sense of ‘that’s not fair’ as you play, because it absolutely isn’t. The only saving grace is that it’s not fair *equally* to everyone involved. That may be little comfort if a bad dice-roll means you lose two thirds of your ship while everyone else gets by unscathed. It’s all fine and well to say ‘this is the funny bit’, but that might not be very convincing in the event everyone else has a ship that sails into the end zone with hulls stuffed with lucrative cargo. The rules state that anyone that makes even a single credit of profit is a winner, but if you’ve got 1c and everyone else got 30c or 40c you’d be forgiven for thinking some winners won harder than others. Much of it, in other words, is almost painfully arbitrary on a case by case basis. In many respects, it’s like a game of Settlers of Catan – over a long, long period of dice rolls you’ll get the correct distribution of rolls for any resource. But, if you’re in a game where you’re on your eighth turn without rolling the resources you need, that doesn’t feel entirely comforting. It’s frustrating, in the way that games based on the arbitrary fate of dice-rolling are. You can either embrace the inherent hilarity of futility, or you’ll have a very unpleasant time with this game. It’s also a game where indirect competition is baked into its bones – the pile of tokens that are available for construction are all constantly in flux, and it’s common to see the piece you absolutely need get hoovered up by an opponent. Nobody has time to explicitly undermine your construction efforts, but it’s hard to accept ‘it’s nothing personal’ when you’re still wildly flipping through the tiles in the hope you find an engine, any engine, to get your truck space-bound. In the journey, to claim a resource is to deny it to other players, and that too can be frustrating if not fully embraced. Nothing in the game, in other words, lends itself well to a positive experience when players are likely to get angry, upset or discouraged. Oh dear, Galaxy Trucker is not doing well in this tear-down at all. We absolutely do not recommend Galaxy Trucker to anyone with significant physical impairments. There’s just so much in the way of physical manipulation of tokens during the build phase – you need to reach over (with one hand, although obviously this restriction can be relaxed as needed), grab a tile and bring it over to your board, and then rotate and position it within the constraints of the slots provided for you. And then, if you’ve made a mistake you can’t undo it – the pieces are supposed to be welded into place. You’d need to house-rule so much of this basic system to make it accessible to those with physical impairments that it wouldn’t in any meaningful sense be the same game. Many games can permit for a proxy to act as the physical agent in game interactions – Galaxy Trucker doesn’t lend itself well to this either. Grab me the hazardous cargo bay with the two universal connectors, it’s on the top in the middle of all the crew cabins. Get me the crew cabin with the two single connectors and the universal connector. No, not that one – that one has a double connector and a universal connector. The other one. Can’t I just get a USB cable? It could be done. I submit to you though that it shouldn’t be done because it wouldn’t offer many opportunities for actual fun. 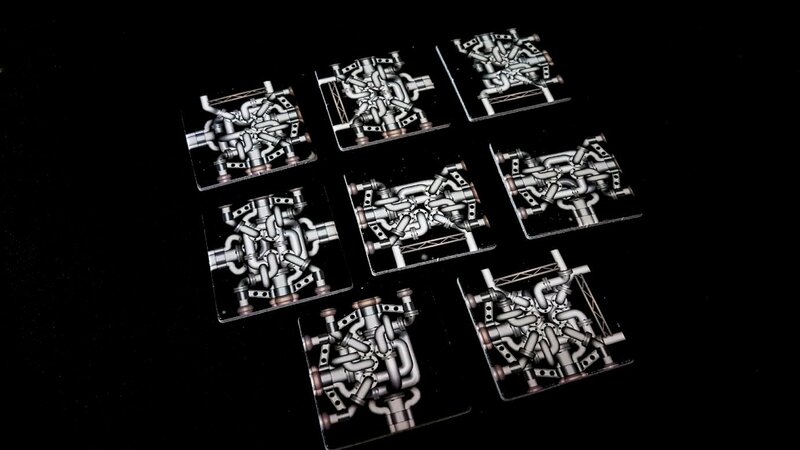 However, they’re also very small, very fiddly, prone to rolling and must be individually manipulated on battery tokens. One single battery may have two or three of these, and there are some strategic implications that go along with deciding which ones you want to spend. It’s perfectly possible you’ll want to pluck one out of the middle of a cluster on your ship rather than go for the one that’s easiest to get. All of this you can get someone to do for you, but if a sense of agency and independence is important in playing these games, and we submit it absolutely is, we can’t really recommend Galaxy Trucker in this category. At all. There’s some good news in the socioeconomic category – there’s a lot to like here. The game is utterly gender and ethnicity independent except when it comes to the pink and blue aliens. The game art is accessible and enticing, setting this up as a title of comedy despair right from the very start. The theme may seem a little dry (it is, after all, essentially about long haulage), but as with Suburbia once you get past it you shouldn’t have any difficulty in getting people to invest their energy in the game. Tokens represent no obvious cultural or philosophical bias. The manual too exhibits no meaningful biases, and is written in a way that is both engaging and thoroughly accessible. Wall to wall, it gets off Scott free here. I mean, look at all that – those boards too are double sided, so you get enough ships for four players, and for each player to get to build three increasingly complex ships. 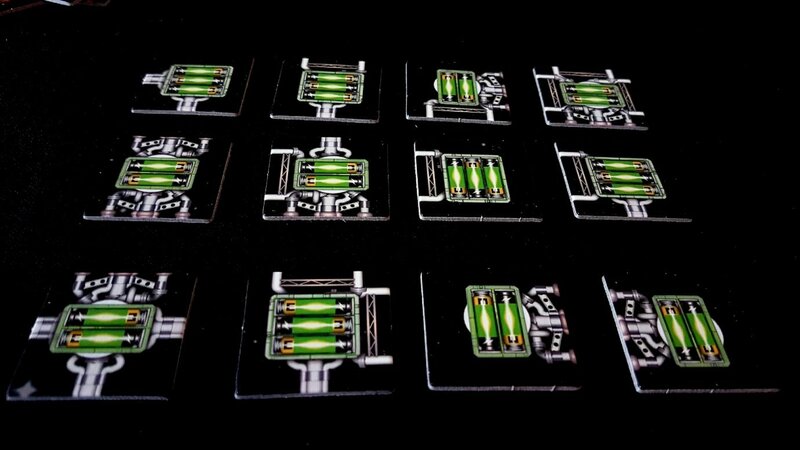 Production values are great too – you can feel a genuine clink of quality as you cast the cardboard tokens down. For all their size and thinness, they have the satisfying seduction of fine poker chips. No complaints here at all. We’ve covered most of the significant issues here already, but let’s recap where there are some considerable inter-sectional complexities. First of all, the construction phase has a combinatorial effect – light cognitive impairment *or* light physical impairment wouldn’t invalidate anyone’s game experience, but the sheer number of tokens, choices and places to put them can compound combined issues in such a way as to add a barrier that might not exist for one or the other. The use of time-constraints too, while mentioned repeatedly above, are likely to compound issues of physical and cognitive intersectionality. Luckily, it’s a game that does easily permit players to drop in and out – once a ship has entered the convoy, there’s not a lot of decision making involved. A player can simply provide a ‘standard operating procedure’, allow other players to choose for them, or simply bow out of the journey. The full game involves making three progressively more complex ships which undertake three progressively more dangerous journeys, but there’s no requirement for a player that makes one ship to make another. It’s possible to hand-off responsibility too – there doesn’t have to be a continuity of a player for their contribution to be meaningful. This means those with conditions that intensify or lessen as time goes by can moderate their involvement without impacting negatively on the others playing the game. The symbolism for the cards is reasonably simple, but it does add a certain compounding issue of accessibility for those with cognitive and visual impairments – the symbols, combined with the relatively meagre visual differentiation as to size, can make it difficult to work out what kind of horrible thing is being sent under which conditions. As mentioned above, it’s possible for a single person to go through the journey and outline events, but it’s still something that has to be taken into account for situations where that may not be possible, or feasible. So, how did it do in its teardown? Let’s find out. So – we don’t really recommend Galaxy Trucker on the grounds of its accessibility, because it has precious little of it. We gave it three and a half stars in our review – there are bits of the game that are easily Five Star Fun, and bits that aren’t. But, if you find these kind of games difficult to interact with there are many titles that we would recommend in preference to this one. Sorry Vlaada – your game is great but it’s not at all inclusive.